That’s where the Retro Receiver comes into play. Announced back in April for the original Nintendo Entertainment System and the Japanese Famicom, the simple accessory lets you easily use modern wireless controllers on your classic Nintendo consoles. Now it’s also available for the Super Nintendo (and Super Famicom) which is the version we had the opportunity to try out with an original SNES. Do you remember how to plug in your SNES’ controllers? Then you already know how to connect the Retro Receiver. Getting the Retro Receiver up and running is as easy as plugging a controller into the front of your Super Nintendo—but it might actually be easier since there’s no cord to first untangle. The adapter draws all the power it needs from the SNES’ controller ports, so you don’t even have to worry about recharging it. A single red button puts the adapter into pairing mode, while a microUSB port lets you easily perform firmware updates. With your console powered up, pairing the Retro Receiver with a Bluetooth-compatible wireless controller just requires you to push the single red button on the front of the adapter once the controller has been put into its own pairing mode. The two will then talk, perform whatever electronic handshakes and agreements are required to work together, and then you’re ready to play. The microUSB port you see on the front of the SNES Retro Receiver has nothing to do with charging, as previously mentioned. It’s only used for performing firmware updates via a Mac or a PC. That will quash bugs or expand the list of supported wireless controllers. During our time testing the adapter there was already a firmware update made available, so expect them to come as frequently as required. Playing Super Mario World untethered just feels so right. Analogue and 8Bitdo, the co-creators of the Retro Receiver, claim the adapter currently works with PS3 and PS4 controllers, the Wiimote and Wii U Pro gamepads, as well as everything that 8Bitdo currently sells. We tested it with 8Bitdo’s SNES 30 wireless Bluetooth gamepad and the performance was flawless. Pairing was a breeze, and there was absolutely zero lag while testing games like Super Mario World and F-Zero. Playing with what felt like the original SNES controller in hand, except without any wires, was also a wonderful experience. My muscle memory kept expecting to feel the tug of the cord on the back of the controller as I played, but it just wasn’t there. And despite there being a rechargeable battery inside the 8Bitdo SNES 30 controller, it somehow still felt lighter than the original SNES’ controllers without that annoying cable tether attached. This is the part of the review where I’m supposed to point out my concerns with the Retro Receiver, but I’m having a hard time finding any. It works extremely well, it’s easy to set up, and the company behind it is dedicated to doing firmware updates so if there ever is a problem, it will hopefully be quickly resolved. 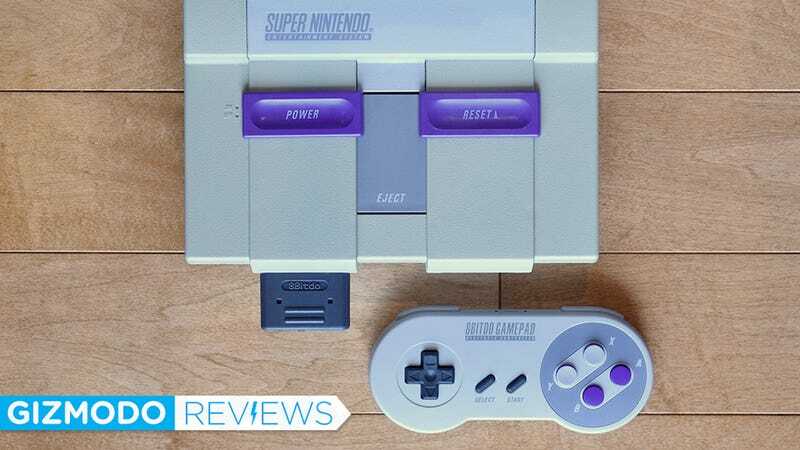 At $20 it’s also a straight-up bargain, but since the Super Nintendo does have two controller ports, a slightly discounted Retro Receiver two-pack might be a nice option. It’s a simple Bluetooth adapter for the original Super Nintendo and Super Famicom that lets you use many popular wireless controllers with the old hardware. As easy to install as the SNES’ original controllers, and pairing is a one-button affair. You will have to bring your own wireless controller, but odds are you’ve already got one at home from your modern consoles like the PS3 and PS4. Doubles as a Bluetooth adapter for a PC using a microUSB cable, if you’re still using a computer from 15 years ago without that functionality built in. It’s just $20, but you’ll need to buy two to make your SNES completely wireless.